Md. Waris is a 12-year-old cheerful boy residing in the slums of 64 Broad Street, Kolkata. His family comprises of his father, mother, and three sisters. Md. Waris’s family has been trying to battle poverty and make ends meet. His father is a rickshaw driver and his mother is working as a domestic worker at someone’s residence. To supplement the meagre family income, Waris had to drop out of school and start working. He is working in a cap manufacturing factory. After spending seven years working in this factory he is as efficient in his work like any other seasoned adult worker. Save the Children formed a Community Child Health and Hygiene Club in Waris’s street as part of the Stop Diarrhoea Initiative. Waris became a member of the club and since then, Save the Children has been engaged with him and his community. Under the Stop Diarrhoea Initiative, Save the Children has been working relentlessly to make the surroundings open defecation free through ODF tool kit. Theatre workshops on issues of safe drinking water and awareness generation sessions on girl safety were organised. Waris has been an active member in all these engagements. These engagements helped Waris to develop an interest in theatre. Theatre has helped him in comprehending water-related problems in his area. Lack of public hygiene, the problem of sewage, and lack of clean drinking water cause diseases such as diarrhoea and dengue. Save the Children’s intervention has made Waris more aware of the issues people face in his community. He said that “When I am older, I will leave this job and get a better paying job. Later I will start my own business and save more and take care of my parents”. Waris is hopeful that his life will change for the better in the future and his economic situation will improve in future. He is confident that he will be able to do something on his own for himself and his family. 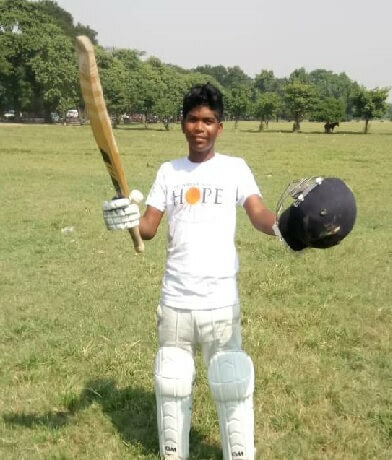 Street Child Cricket World Cup will give him a chance to fulfil his dreams. 14-year-old Ayushman lives in a slum tugged in the outskirts of Kolkata with his family comprising of his father, mother, and three siblings. He is the youngest amongst all the siblings. Ayushman’s father moved to Kolkata in 1979 and worked at a tea producing company for around 25 years until the company shut down in 1995. Currently, he is working as a President of the EJC Durgapur Basti Committee and his mother is a housewife. Ayushman’s life has since forever been full of struggle and obstacles. Save the Children identified him and provided the required intervention that changed things for good. Earlier Ayushman was a shy boy but because of the intervention, he is now a more confident and vocal boy. He now attends school regularly and has a great zeal for sports. His cricket frenzy won him many accolades and he wishes of pursuing a career in it. He has shown exceptional potential in every opportunity he got. He has become more eloquent in expressing his views about the things that are happening around him. Despite every odd, he aspires to be a sportsman. His outstanding performance in the sport is the reason why Save the Children chose Ayushman for the trail and audition of the Street Child Cricket World Cup that will be held in England in May 2019. 13-year-old Lusi belongs to an extremely poverty-stricken family. She is living with her father, mother and five siblings. Her father is a carpenter and mother is a housewife. Currently, Lusi and all her siblings go to school. But because of the financial difficulties their family is facing, Lusi might have to drop out of school. Lusi and her sisters do all the household chores and also go fetch for water from the KMC tank as their slum has no tap water supply. They reside in a heavily populated slum with an unhygienic environment. Adolescent girls in Lusi’s locality are often at a high risk of catching infection because there is just one common toilet which everyone uses. There is a lack of privacy and safety as both men and women use the same toilet. Lusi understands the importance of maintaining hygiene and cleanliness. She actively spreads awareness about the importance of hygiene and sanitation in her community. When Save the Children identified Lusi, she was a docile and unassertive girl who did not have a voice of her own. They encouraged her to attend various workshops and training on Disaster Risk Reduction, resilience, and child protection. These engagements help her gain confidence and raise her voice so that she and other children in her community have access to their rights. Lusi wants to take the lead in empowering more Child Rights Champions and wants to be the voice for equal rights and opportunities for all children. She will get this opportunity at the Street Child Cricket World Cup 2019. 15-year-old Soni lives with her family in the EJC Durgapur Dock Junction area of Kolkata. This area is primarily like a garage for trucks. Her family comprises of her father, mother, and her elder brother. Her parents admitted their elder son in an English medium school but they denied Soni access to quality education. She was sent to a Hindi medium school against her wish. The family was facing an economic crisis and therefore, they could only afford to send their son to a good school. Later, Soni dropped out of school due to various reasons poverty being one of them. Growing up in an urban slum of Kolkata, electricity and clean and safe drinking water was always an issue. This was also one of the reasons why Soni had to drop out of school. Save the Children identified Soni as a drop out. They motivated her to continue her studies. With constant encouragement, Save the Children was able to enrol Soni back into formal schooling. She is currently studying in 9 th class. 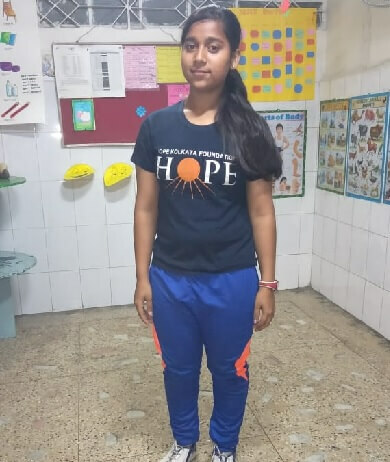 With Save the children’s Mobile Learning Initiative, Soni has improved tremendously in her studies and has exhibited immense growth in terms of personality. Today Soni is an outspoken and confident girl. She has now taken the responsibility of making other children in her community aware about child rights. Soni dreams of training girls in her vicinity in Karate. Knowing Karate will help them become more confident and they will not have to depend on others for their own safety. In future, she dreams of becoming a politician so that she can make her voice reach the masses and work for their betterment. Street Child Cricket World Cup is a platform that will give Soni a chance to raise her voice for the cause she believes in. Millie was born on 10.12.2002. Her parents left her in Sabera Foundation when she was two years old and they never met her after that. Now she stays in Ashar Alo Home. According to Millie her parents left her in ngo Sabera Foundation when she was only 2 years old. After that her parents never came to meet her. After few times Sabera Foundation was closed & the employees of Sabera Foundation produced her before Child Welfare Committee. After that Kolkata CWC placed her in another G2B home in the year of 2014, there she got admission in Modern Public School & completed class VII. When the project of G2B was closed, she was shifted to Ashar Alo girls Home by the order of Kol Child Welfare Committee on 11.10.2017. At present Millie is a beneficiary of Ashar Alo Home, staying in a protection home & getting special education support, proper nutrition, counselling support, medical support etc. As her parents abandoned her when she was just 2 years old, she could never get any kind of parental attachment. Despite her vulnerable childhood history, she coped up well with the help and guidance of the Home. Her shyness got broken; she became very vocal and took much initiative being part of activities in Home. Our intervention made her regular in school and helps in organizing many sports activities within the community as well. How has Hope Kolkata Foundation/partner NGO contributed to the betterment of the child? Facilitators working with the children have been able to bring many changes in her life. She became more eloquent in expressing her views happening in and around her. She now dreams about her career in sports. She showed exceptional potential in every opportunity she has been provided with. Her outstanding enthusiasm in games made the selecting members of SC to choose him for the trail and audition of street children world cup to be held in England early in May 2019. Jabir lived with his family along with his four brothers and three sisters at street pavement of Gariahat area. His father was unemployed and drug addicted person who is the cause for violence in the family . He was physically and mentally tortured by his addicted father. His father expired due to Tuberculosis. His mother is a daily labour. Being the sole earning member of the family, it becomes very difficult for her to support her large family and to fulfil their basic needs. He faced extreme poverty in his child hood which forced him to be a child labour. The child was a beneficiary of Nabadisha Centre (Education centre of Hope Kolkata Foundation) in Gariahat. Besides attending supplementary education centre, the child was involved in selling incense sticks. He had to run the family for their survival with the minimum money which he earned from his selling the incense sticks. The child was deprived from his basic needs. After family intervention and assessing the need, the Social worker of Nabadisha centre had produced him before Child Welfare Committee. After that, he was placed to Ashirbad Boys Home as per the order of Child Welfare Committee Kolkata . He gets love, care and affection in this protection home and all other support required for his holistic development. His other brother and sister was also taken care and sponsored through boarding school. He feels safe and secure in protection home with all the other children. 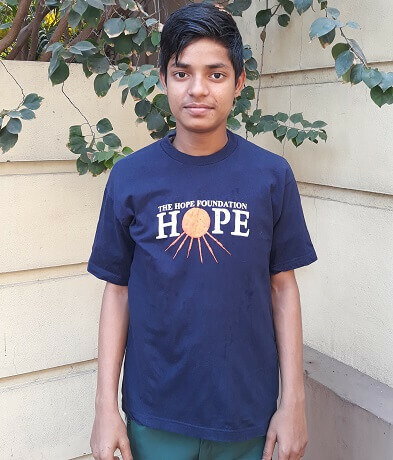 After placement in Ashirbad Boys Home he started formal schooling and he attends his school regularly and he enjoys attending extracurricular activities. He wants to be a cricketer. He enjoys playing cricket and he regularly attends cricket coaching classes. Jabir wants to become an all rounder in bowling and fielding. Cricket is his dream . He wants to pursue cricket as his career. Anjali was born on 13.08.2004 in Bihar. She lived with her father, mother, grandmother and two elder bothers. When Anjali was 5 years old her father passed away in an accident and since then they migrated to Kolkata and lived on the streets. Her one brother is working as a driver now and her younger brother is studying in class 11 at Future Hope. When Anjali was 5 years old her father met an accident, and passed away. Since then they migrated from Bihar state to Kolkata and lived on the streets. Her mother is a solo bread earner of the family. She is now working as a domestic helper and earns Rs 3000/- per month; and thus, her income is not sufficient for entire family. Due to this situation, her mother is not able to take proper care and protection of Anjali and her younger brother. At present Anjali is studying in class- 9 at La- Maternelle High School. She has a remarkable quality of leadership and her participation ability is strong. She excels in every field; she is very creative and has a passion in playing cricket. But because of her financial crisis, her mother cannot fulfil her wishes. Anjali is a bright child. But due to her families physical and financial condition she could not express her creativity freely. The interventions at this Home helped her alot. Now she attends school regularly, participates in every activity and sports. With this homes support Anjali got an opportunity to play Street Children Cricket World Cup and is going to London for the same. How has Save the Children/partner NGO contributed to the betterment of the child? Before coming to this protection home, Anjali was in a vulnerable condition as she used to live on the streets of Kolkata, where the physical conditions were extremely unsafe and being a girl child, her protection was questionable and she never got proper nutrition. This protection home took her responsibility and provided her with shelter home, proper nutrition and formal education. 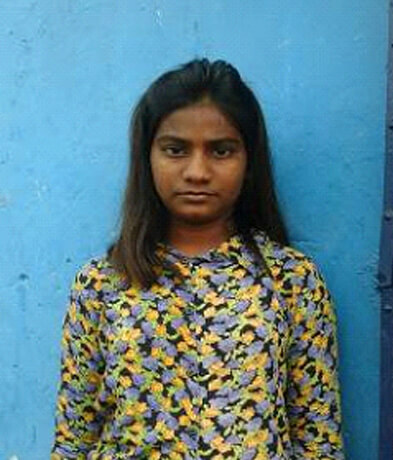 Now Anjali is a healthy child, she attends school regularly, and participates in every extracurricular activity. 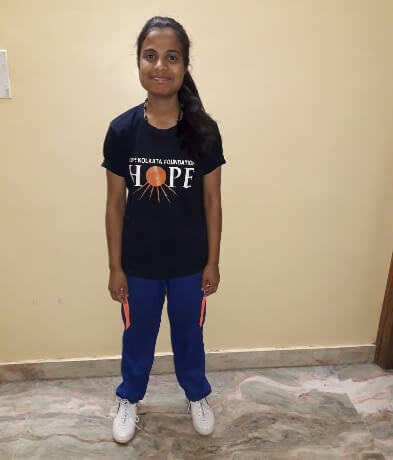 Staying in this home, provided her with an opportunity to express her zeal for sports and thus made the selecting members of SC to choose him for the trail and audition of Street Children World Cup to be held in England early in May 2019. She wants to become a nurse or hair hostess and If given an opportunity she would aspire to become a Cricketer. Tarak lived on the street of Gariahat with his mother. His father became more irregular in taking his child and left them . His mother took a job at Gariahat market. She earns little money so she was unable to give her child nutritional, educational support and fulfil the other needs of the child. Tarak’s mother had to go out to work every day and Tarak used to wander about without any family care to look after them and without any food to eat. There was no one to take care and attend the child, during the working hours of her mother. He was sick lying on the street with not be cared. The local police and the social worker of the organisation placed Tarak before the Children Welfare Committee. As per Children Welfare Committee’s order, he was placed in Ashirbad Boys Home under Hope Kolkata Foundation . 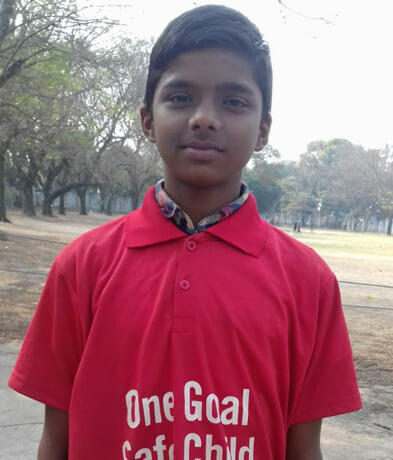 Tarak is passionate about sports and regularly participate in the school’s sports activities. He regularly attends cricket coaching. He loves to play as a batsman. His favourite cricketer is Virat Kohli. Tarak loves Kohli’s aggressive style in the field try and he tries to imitate and follow the same in the practice sessions as well. Kohli is his inspiration. Saraswati is 15 years old. Her father’s name is Dhunak Dhanuk and he is a daily labourer. His monthly income is Rs 5000. Her mother’s name is Madhuri Dhanuk who is a housewife. Sarawswati has an elder sister named Santoshi Dhanuk. Both the sisters study in Class X of Modern Arya Parishad Vidyalaya. She and her family live in a slum in the EJC Durgapur Dock Junction area of Kolkata, Ward No 79. This area is primarily like a garage for trucks and the workers have made settlements alongside the same. The area is very congested with huge vehicles occupying most of the space making it very unsafe for the movement of the children. The area remains very unclean and unhygienic as the local facilities are very limited. Saraswati was a school drop out when the Mobile Learning Centre team identified her in 2014. After counseling and lot of pursuance she was readmitted in the school in Class VII. The team spoke to the parents as well as the neighbours to create a supportive environment for Saraswati. She was encouraged to be part of a children’s group and with time she has emerged as an active Child Leader. She has been part of several advocacy and campaign initiatives voicing for the rights of the children. She has received several trainings and orientation and has gradually emerged as a patient, confident and assertive Child Champion. Saraswati is a very active Child Champion. She keeps watch on every child in her area and whenever she finds any child discontinuing his or her education, she prompt informs the team of MLC. 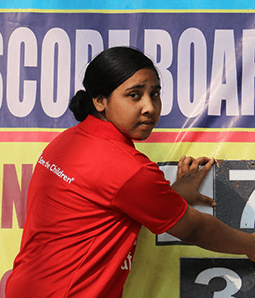 Saraswati has been part of campaigns for street children and have participated in observation of International Day of the Street Children in 2016 and 2017. She also addressed Press Meet organised to launch the CRC week observation in 2016 sharing the space with other prominent Child Champions speaking for the rights of the children.